It’s the longest four-letter word on Wall Street or in investor’s minds. It’s evil, it’s void of value, it’s our enemy! Or is it? Those of you that have followed me for more than a few months know that I assert that volatility is a trader’s best friend. That’s right, Commandment number eight states “Volatility is a trader’s best friend”. Why is that, and how does it apply to the moves that I’m about to make (and maybe you) to uncover opportunities. 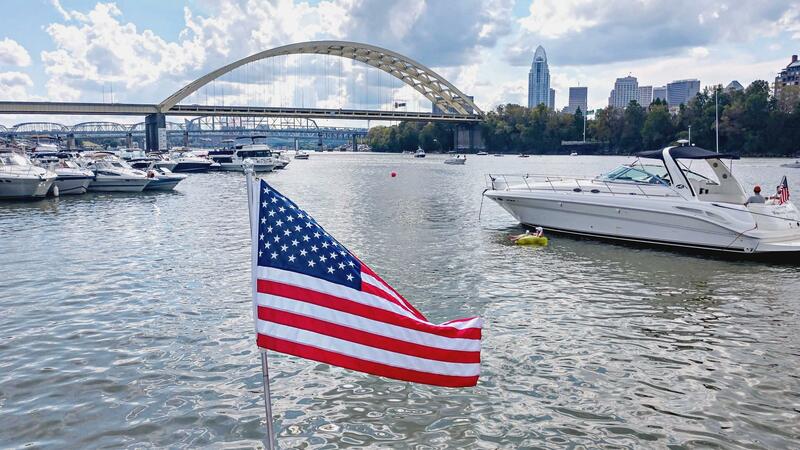 October is the gateway to what is normally a generous period for the market. The catch? You have to run the volatility gauntlet first. How much volatility? Well, looking back to 1990, the S&P 500 is 15% more volatile than any other month of the year. 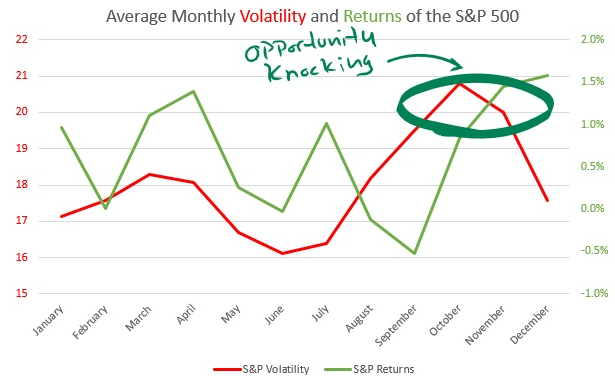 The chart below displays monthly volatility for the S&P 500 ($SPX), notice the jump in August and peak in September? Feels familiar, doesn’t it? It should as the S&P 500 on Friday was registering actual volatility readings that are 213% higher than the beginning of September. While actually volatility is through the roof, the market’s perception of how volatile the rest of October will be is low. On Friday, the CBOE Volatility Index (VIX) is 65% higher than its average readings in September. Hold on! Actual volatility is 213% higher and the market’s perception of the upcoming volatility is only 65% higher?!!? This screams something to me, as it should to you, the market’s declines aren’t finished yet which means you should be stepping forward with caution. Despite the surge in selling and volatility last week, investors are still relatively complacent which is often a sign that the market has more to work out before stocks are at an investable bottom. Always wanting to quantify these things, I quickly tested the market’s reaction to spike in the VIX and the results uncovered a familiar term “Dead Cat Bounce” (all respect to those cat lovers out there). 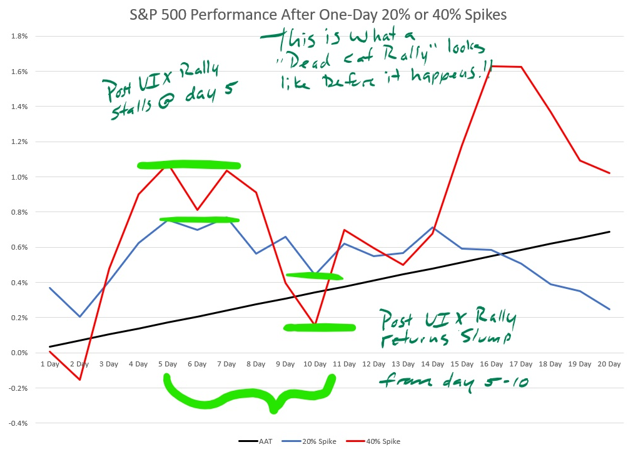 According to my tests, the S&P 500 has a put in an initial rally of around 1% after the VIX make a 40% or higher spike. That 1% rally happens within the first five days but is then followed by a selloff between days 5 and 10. Finally, after the market retests its lows (and the VIX spikes for a second time) stocks switch back into rally mode for a more robust rally that often carries us back to highs. So, where does that leave you and I in sorting out whether its time to load up on stocks or not? Well, according to the chart and data I used above, the wise move is to wait until the VIX has its chance to make another move higher. On Monday, the major indices were able to stabilize after Friday’s rally, but the S&P 500 is now doing a tightwire act on its 200-day moving average that if broken, would serve as the catalyst for that dead cat bounce to play out. Looking out beyond the next ten days, remember, the October volatility creates opportunity for those traders willing to watch closely enough. 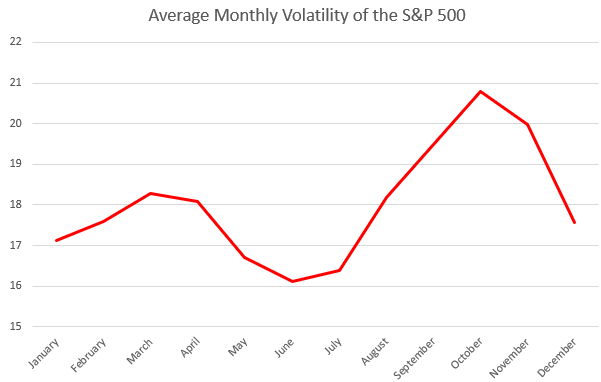 I’ve revised the monthly volatility chart used above to include the average S&P 500 Performance for each month. The distinct cross between volatility declining and returns increasing tells you everything you need to know. Volatility is going to decline between now and the end of the year while returns begin to climb again. The fools running around trying to avoid the volatility often wind-up ignoring this clear opportunity and missing out on some great profits as November opens the door to one of the strongest seasonal trading of the year.